Paris: Two Cities Editions 1960, bound in wraps, one of 1,000 copies. Maynard & Miles A3a. 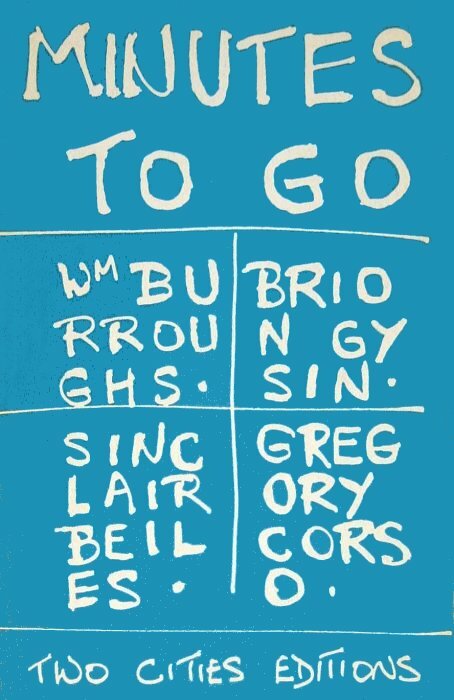 A collaborative effort between Burroughs, Brion Gysin, Sinclair Beiles, and Gregory Corso, and the first of the “cut-up” publications. There was also a limited edition of 10 copies (only five of which were for sale) each signed and numbered by the publisher and containing a manuscript page from each of the 4 authors. Contrary to Maynard & Miles statements, these copies are not printed on special paper or in special bindings. They are merely the standard work signed and numbered with an envelope containing the manuscripts pasted onto the inner rear cover. These were offered for sale at $25.00 each, rather more than the $1.50 retail for the trade edition. A copy of the limited edition is held at the Brown University Library and includes a letter from the publisher outlining prices for the different issues of the work. Correspondence from Miles indicates that most of the 1,000 copies had a wraparound band but these are seldom encountered now. San Francisco: Beach Books 1968, bound in wraps but a different design from above, text is the same, one of 1,000 copies. Maynard & Miles A3b.